Do you notice some of your favorite beer labels on that list? 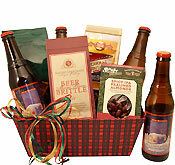 This selection of holiday brew includes some of the most popular brands, but the flavors selected may be new experiences even for experienced beer drinkers. 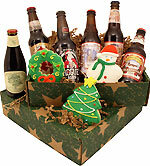 Each bottle contains seasonal beer brewed in honor of the holidays. The insulated beer cooler comes with handles that allow for easy carry, and that will make it so much easier for your loved ones to take their favorite brew on the go long after the holiday season passes. Orders received by 12pm PST Monday through Friday will ship the same business day. Orders received after 12pm PST Monday through Friday will ship the next business day. Orders received on Saturday, Sunday & Holidays will also ship the next business day. Business days are Monday through Friday. IMPORTANT: You must be 21 years or older to order and receive this product. An adult signature is required upon delivery. 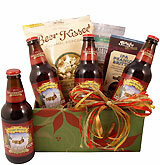 PLEASE NOTE: We cannot ship beer to the following states: Kentucky, Mass, Oklahoma, Pennsylvania, South Dakota & Utah. It was a success!!! My husband is hard to buy for but it was one of the few things he received that he didn't want to take back! And the carrier is something he can use over and over again. Thank you to your team. Love that it was local too! 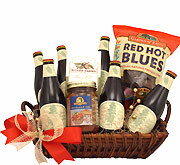 Great service, easy to select, right price for package, shipment was on time, great selection of beers. Will return again. good selection, easy to order, delivered on time. My nieces loved it - won best present award. Copyright © BeerGifts.com 2019. All rights reserved.